[Infographic] You Think Candidate Experience Doesn't Matter? Think Again. Known as the market leader in next-generation endpoint security, network security, and threat intelligence driven by machine learning, Webroot was facing several challenges with their hiring process. One of Webroot’s biggest issues revolved around managing their dynamic hiring needs. With just one full time employee and one contract recruiter to manage their process, it was difficult to adapt to hiring fluctuations throughout the year. In addition, the few recruiting metrics that were being monitored and calculated were being handled manually. Webroot wasn’t effectively tracking candidates, so job seekers were receiving little to no communication. Because sufficient tracking didn’t exist, Webroot had no way to monitor, calculate, or forecast recruiting costs. Last, but definitely not least, their time-to-fill was averaging 90 days from launch to offer acceptance, reducing Webroot’s overall productivity. 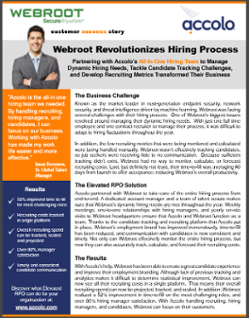 Accolo partnered with Webroot to take care of the entire hiring process from end-to-end. A dedicated account manager and a team of talent scouts makes sure that Webroot’s dynamic hiring needs are met throughout the year. Weekly meetings, one-to-one relationships with hiring managers, and yearly on-site visits to Webroot headquarters ensure that Accolo and Webroot function as a team. Thanks to the candidate tracking and recruiting platform that Accolo put in place, Webroot’s employment brand has improved tremendously, time-to-fill has been reduced, and communication with candidates is now consistent and timely. Not only can Webroot effectively monitor the entire hiring process, but now they can also accurately track, calculate, and forecast their recruiting costs. With Accolo’s help, Webroot has been able to create a great candidate experience and improve their employment branding. Although lack of previous tracking and analytics makes it difficult to determine statistical improvement, Webroot can now see all their recruiting costs in a single platform. That means their overall recruiting spend can now be projected, tracked, and scaled. In addition, Webroot realized a 52% improvement in time-to-fill on the most challenging roles, and over 80% hiring manager satisfaction. 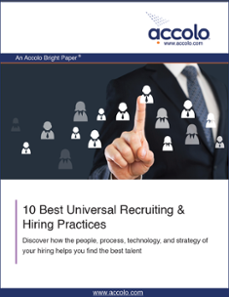 With Accolo handling recruiting, hiring managers, and candidates, Webroot can focus on their customers.